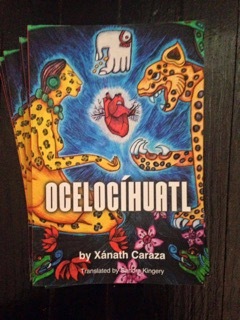 The title of this collection of poems by Xánath Caraza, Ocelocíhuatl, comes from two Náhuatl words: ocelote, a member of the jaguar family, and cíhuatl the word for woman. The result is a kind of 21st century, female, Aztec warrior. The Spanish poems also appear in English rendered by seasoned translator Sandra Kingery. Four of the poems appear in Náhuatl with translations by Tirso Bautista Cárdenas. Imagine the letter X. The poems in the first half of the book are arranged along one axis, those in the second half along the other. At the intersection, presiding over everything, is Ocelocíhuatl the Jaguar Woman of the title. The first poems deal with issues of social justice, both in the US and abroad. The opening poem explores the tragedy of the 43 missing students from Ayotzinapa, Mexico. This is followed one about Michael Brown from St. Louis, Missouri. This poem is carefully linked to the earlier one. Others deal with undocumented immigrants found dead in the desert, about children in Bosnia, and about the aftermath of war in Croatia. In each, Caraza explores her relationship with poetry and with the world. The Aztec deity Macuilxochitzin in the poem “Weaver of Words” could well be the autobiography of the poet herself. Your verses enter the home of the Lord of the Far and the Near like gusts of wind. They raze everything with the strength of your voice You are reborn on these pages Chronicler of paternal victories, now you, eagle warrior woman, jaguar warrior woman. Words of jade are chiseled in your memory. We meet the Jaguar Woman halfway into the book. Oceclocíhuatl walks the humid jungle of poetry. She sees what others do not. “Her hands catch the alphabet of dawn.” She breathes the scent of those no longer there. Oceclocíhuatl is a wonderful collection by a talented writer and her talented translator. The two collaborated on Caraza’s previous book Sílabas del viento/ Syllables of Wind and this one surpasses it. I’m anxious to read the next. Estrellas de malaquita parpadean en la profunda obsidiana. Se entierran en la piel nocturna, en la bóveda infinita. Son esas constelaciones que me llevan a ti, poesía, poesía que embriaga, que gira en los laberintos del tintero. Se deslizan estrellas de malaquita en hojas de papel amate que forman este libro que escribo, este poemario cibernético que salta a la vista. Las letras toman vida en el fondo de obsidiana, me hablan, me susurran su camino. Las acomodo sin prisa, para formar los versos, malaquitas tatuadas en la bóveda celeste, donde el futuro está guardado, donde la esperanza lleva tu color. Te pienso poesía y me estremezco, me haces vibrar, poesía extraviada, poesía callada, poesía que embriaga, me haces bailar poesía en tus brazos, me guías con seguridad, me haces sentir poesía, me observas calladamente poesía, poesía de malaquita, estrellas fugaces en la tinta de obsidiana, en la bóveda infinita frente al mar, poesía, poesía, me guías en la oscuridad. Gaviotas flotan en la corriente del pensamiento, se dejan ir sin temor, cual jinetes expertos se montan en la poesía y abren su imaginación. Estrellas de malaquita en la profunda obsidiana. Me abrazas poesía, me guías en este baile de estrellas de malaquita, en esta lluvia de estrellas que cae en el tintero, en el fluir de las páginas, te busco poesía, te encuentro en el ardiente corazón. Malachite stars twinkle in profound obsidian. They are buried in the nocturnal skin, infinite vault. These are the constellations that bring me to you, poetry, poetry that enraptures, that spins in the labyrinths of the inkwell. Malachite stars glide onto sheets of amate paper that comprise this book I’m writing, this cybernetic collection of poems that leaps into sight. The letters come to life in the depths of obsidian, they speak to me, they whisper their path. I arrange them steadily, to create the verses, malachites tattooed on the sky blue vault, where the future is stored, where hope wears your color. I think you poetry and I tremble, you make me vibrate, mislaid poetry, silent poetry, poetry that enraptures, you make me dance poetry in your arms, you lead me confidently, you make me feel poetry, you observe me silently poetry, malachite poetry, shooting stars in obsidian ink, in the infinite vault before the sea, poetry, poetry, you lead me in the darkness. Seagulls float on the current of thought, they let themselves go without fear, like expert jockeys they mount the poetry and open their imaginations. Malachite stars in profound obsidian. You embrace me poetry, you lead me in this dance of malachite stars, in this rain of stars that falls on the inkwell, on the flow of the pages, I seek you poetry, I find you in the ardent heart. En la cintura la fuerza encarnas, Macuilxochitzin, con el telar de palabras entrelazas los recuerdos, el color, la poesía. Flor y canto, in xóchitl in cuicatl, en la urdimbre de tu voz palpitan. En los eternos trazos los tlacuilos dibujan sílabas turquesas con ondulado ritmo de caracoles púrpura. Diseños de obsidiana mezclados con cascadas de cempaxóchitls en el papel amate. Humo sagrado de copal bendice tus cantos, baña tus manos, las tatúa de versos. Nobleza en tu linaje. Sabios, emperadores, poetas y guerreros fluyen en la sangre de jade, rebosantes venas. Sensibilidad en las manos, en la piel morena. Son los ritmos del huehuetl los que conjuran la palabra, la garganta se abre, el bermejo corazón late. Las caracolas anuncian el carmín de tu pensamiento con música en el aire. El teponastle resuena en el vientre con ancestral oquedad añil. Pintora de palabras, la que trae la fuerza del mar en la voz, la brisa en la mirada, los recuerdos se imprimen en el papel amate, las refulgentes estrellas de malaquita danzan con tu canto, Macuilxochitzin, mujer poeta. Blanco huipil vistes cada mañana, iridiscentes bordados en el algodón y estampado el símbolo de la serpiente emplumada, la evolución. Negra cabellera flota en el aire, se enreda con los hilos de la voz de Ehécatl, Dios del Viento. Hija de noble guerrero, Tlacaélel, llevas el triunfo y la estrategia en la sangre de jade, poesía tatuada en la piel. Que comiencen las danzas del maíz. Que se desborde el agua de los ríos. Aroma a vainilla inunda los sentidos, la otra música en el aire. Que se eleven los cantos. Tus versos entran a la casa de las pinturas, del señor del lejos y del cerca, como ráfagas de viento. Lo derrumban todo con la fuerza de tu voz. Renaces en estas páginas. Cronista de victorias paternas, ahora tú, guerrera águila, guerrera jaguar. Palabras de jade se esculpen en la memoria. Filigrana de oro grabada en el corazón, tus versos, tu crónica. El telar de cintura se llena de palabras, sílabas se entretejen con el color de tu voz, la calidez de tus manos las guía para perderse en la infinita melodía. Flores en la sangre, Macuilxochitzin, elevo mis cantos contigo. Obsidiana líquida se entierra en el papel amate para la eternidad, in xóchitl in cuicatl. Your waist embodies strength, Macuilxochitzin, with your loom of words you intertwine memories, color, poetry. Flower and song, in xóchitl in cuicatl, pulsating in the warp of your voice. In eternal lines, the tlacuilos trace turquoise syllables with the undulating rhythm of purple sea snails. Obsidian designs mingle with cempaxóchitls that cascade on amate paper. Smoke of sacred incense consecrates your incantations, bathes your hands, tattoos them with verses. Nobility in your lineage. Sages, emperors, poets and warriors flow in your blood of jade, your brimful veins. Sensitivity in your hands, your brown skin. The rhythm of the huehuetl conjures the word, your throat opens, your auburn heart beats. Conches announce the carmine of your thoughts with music in the air. The beat of the teponastle resounds in your belly with ancestral indigo hollowness. Painter of words, you, female poet, carry the strength of the sea on your voice, the breeze on your gaze, memories printed on amate paper, lustrous malachite stars dance with your incantation, Macuilxochitzin. Every morning, you don your white huipil, iridescent embroidering on cotton, printed symbol of the plumed serpent, evolution. Black tresses floating in the air, tangling with the threads of the voice of Ehécatl, God of Wind. Daughter of Tlacaélel, the noble warrior, you bear triumph and strategy in your blood of jade, poetry tattooed on your skin. Let the maize dances begin. Let the river overflow its banks. The scent of vanilla floods the senses, the other music in the air. Let the incantations soar. Your verses enter the home of the Lord of the Far and the Near like gusts of wind. They raze everything with the strength of your voice. You are reborn in these pages. Chronicler of paternal victories, now you, eagle warrior woman, jaguar warrior woman. Words of jade are chiseled in memory. Gold filigree engraved on the heart, your verses, your chronicles. The backstrap loom is filled with words, syllables are interwoven with the color of your voice, the warmth of your hands guides them to lose themselves in infinite melody. Flowers in your blood, Macuilxochitzin, I raise my incantations alongside you. Obsidian liquid buried on amate paper for all eternity, in xóchitl in cuicatl.